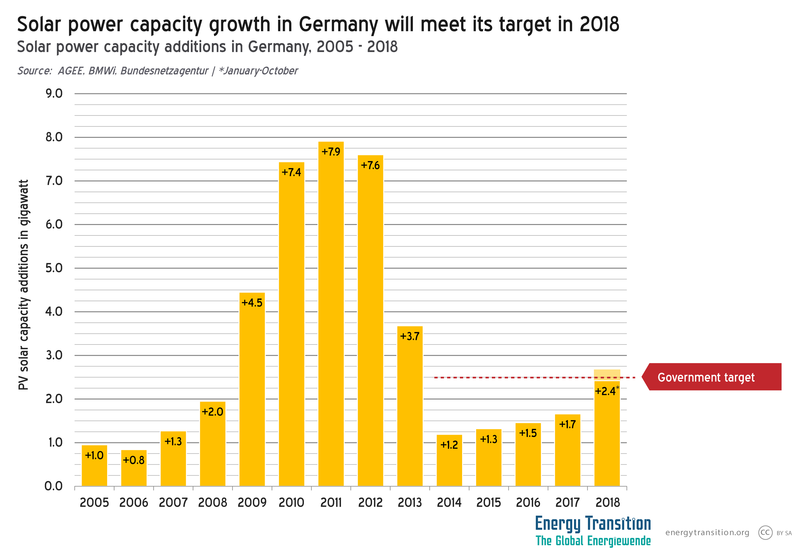 For the first time in five years, in 2018 Germany is on track to reach its annual expansion goal of 2.5 GW. With the goal in sight, German solar industry lobby group BSW Solar subsequently called on the government to reconsider its current unpopular 52 GW cap on support, which at current rates could be reached by 2020. And expansion rates could be boosted even further once the removal of import tariffs translates into a further drop in panel prices. At the end of October, Germany’s cumulative installed PV capacity since the adoption of the nation’s renewable energy law (EEG) had reached 45.3 GW. Indeed, according to new figures, Germany added 182 MW of new PV capacity in October, the vast majority of which was small and medium-sized PV rooftops. The new totals are slightly less than September’s total of almost 200 MW. Reflective of both its growing popularity and decreasing generation costs, earlier this year Germany’s Federal Network Agency (Bundesnetzagentur) held a second joint tender for large-scale solar PV and on-shore wind. As in the first auction of the same kind held in April, only bids for solar projects were awarded a contract. Combined, the Bundesnetzagentur selected 36 PV projects with a combined capacity of 201 MW. The auction’s final average price was €0.0527/kWh, which is significantly up from €0.0467/kWh registered in the April auction. Bids ranged from €0.0465/kWh to €0.0579/kWh. Overall, 10 projects totaling 65 MW were awarded in the German eastern region of Brandenburg. German developer Enerparc, meanwhile, won eight projects. Reflective of increased solar energy conversion and falling generation costs, “the joint tender process looks like an additional invitation to tender for solar projects,” it added. Despite the fact that Germany receives comparatively little sunshine, it has become a surprising global leader in solar power. Led by energy enthusiasts, early adopters drove not just the installation of panels, but the manufacture of them as well. Production really took off after 2008 and for a brief period Germany became the world’s largest manufacturer. Financial support under Germany’s Renewable Energy Act (EEG) allowed generation capacity to grow more than sixfold in only five years and firmly established the technology as a main pillar of the Energiewende. Nevertheless in 2012, Jürgen Grossmann, then CEO of energy company RWE AG, Germany and Europe’s worst polluter, claimed that supporting solar power in Germany was as smart as “farming pineapples in Alaska.” Five years later, the nation ranked first globally in solar power capacity installed per capita. Though the nation’s solar manufacturing sector has dramatically shrunk and state-mandated support rates have dropped, an upswing in new industrial installations, the rising availability of home power storage appliances, a growing awareness of the need for clean energy, and other factors has propelled increasing deployment. Reflective of this, as of December 2018, Germany’s home-mounted battery plus PV firm, Sonnen GmbH, has received prequalification from transmission system operator, TenneT to participate in Germany’s primary control energy market. While it is currently allowed to deliver 1 MW, the next goal is to supply 100 MW as the energy balancing concept is worked out. Nationwide, Sonnen has sold around 30,000 battery storage systems. While its customers typically consume 70 percent of the power they produce themselves, the batteries help them store power for later use, release it to the public grid, or share it with other Sonnen community members in an online Network. Sonnen and its partners will combine its nationwide network of residential battery systems into a large virtual storage unit that will, among other services, help compensate for fluctuations in the power grid. Jean-Baptiste Cornefert, head of Sonnen’s eServices retail unit, told Reuters that the company will now begin bidding in the nation’s primary balancing power auctions by pooling the power generation and storage of its thousands of small customers. “For the first time, a big network of home storage systems becomes a protagonist in the energy market,” Cornefert said. This will place Sonnen directly in competition with 25 German power firms, including fossil fuel dependent RWE and Uniper. Though solar power provided less than seven percent of total power consumption in 2017, it has already significantly impacted the power system structure. The rapid increase in capacity has made available huge quantities of electricity in the middle of the day, when both sunshine intensity and power demand usually are highest –profoundly effecting the balance of amount of supply and upsetting longstanding business models. 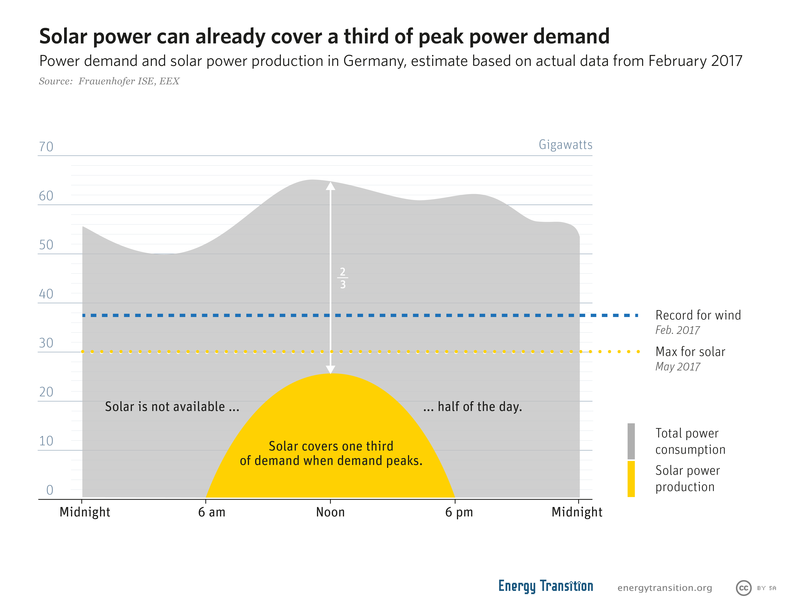 At peak output times, up to 40 percent of the Germany power mix can come from solar panels. According to the Freiburg-based research institute Fraunhofer ISE, the output profile of solar arrays and the usual pattern of power demand match so well that older coal plants, which are too inflexible to respond to short-term fluctuations, have become economically unviable. In fact coal plants may no longer operate at a profit at all once solar capacity has reached a certain threshold, solar energy researcher Quaschning says. So RWE, to borrow from the film “Good Will Hunting,” how do you like those pineapples?